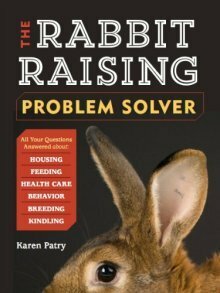 Killing rabbits for food. Here are several humane methods for butchering rabbits for food. 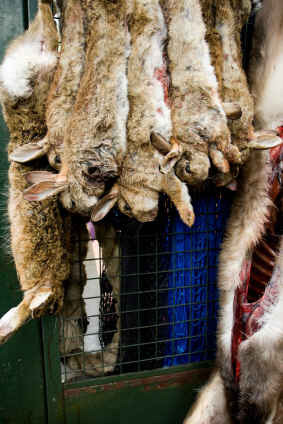 These humane methods result in a painless lights-out for the rabbit. In the opinion of the rabbit butcher at Aurora Rex Rabbit Ranch, there are at least three very humane methods of killing rabbits for dinner. Any stress during the butchering process can result in the release of adrenaline and other endocrine hormones associated with the animal’s flight response. These hormones negatively affect the flavor of the rabbit meat, and will toughen the meat. If your farm’s rabbit meat tastes sweet like chicken, that means the rabbit died peacefully and humanely. A broomstick or other straight pole is placed on the rabbit’s neck. The broomstick secures the rabbit’s head on the ground while the rabbit is pulled upward at 90 degrees by its hind legs. The process is very quick and painless, and nearly foolproof. First, place the rabbit on the ground in front of a handful of alfalfa hay or other treat. Second, place a broomstick across the rabbit’s neck. Third, step on one side of the broomstick. First: Death throes are proof of death - hence, ‘death’ throes. The neck bones have been completely separated at the base of the head, terminating all signals from the brain to the heart, lungs, and rest of the body. Second: The rabbit’s eyes might be open. 'Open' does not mean 'aware.' It just means there are no signals to tell the rabbit to shut its eyes because it is dead. Fifth, cut off the rabbit’s head through the break in the neck. This involves cutting through muscle and fur only, since the neck bones are completely separated. Sixth, hang the rabbit by the hind legs to complete the rabbit slaughter and cleaning. This is the method of killing that the Bible specifies. Despite this fact, our butcher does not utilize this method, possibly because it doesn’t result in instant death. Nevertheless, there must be some reason why the Good Book mandates it. Since God declares Himself to be loving in nature ("God is love" 1 John 4:8), and since God frowns on cruelty to animals (Exodus 23:4, 12, Deuteronomy 22:1, Proverbs 12:10, to name a few among many passages), we believe that this method probably results in far less stress to the animals than we would tend to assume. In South America, we watched Peruvians butcher their cattle by slitting the throat and by puncturing the heart. The animals showed no distress whatsoever. As their blood pressure bottomed out over a period of about one minute, their knees buckled, they sank to the ground, and the lights were out permanently. In their reality, they simply went to sleep. Place the rabbit on the ground in front of a handful of alfalfa or other treat. Slice through both jugular veins. In a minute or so, the rabbit will be dead, and entering death throes. Cut the head off and hang the rabbit up by the feet so it can finish draining. If you have trouble cutting through a joint in the neck bones, you can disarticulate the neck with the same motion utilized in the broomstick method, and then cut the head off. A sharp blow to the base of the head, done correctly, results in instant death. The blow by itself disarticulates the neck resulting in death. We consider the Fatal Blow to be very humane, however there is more room for operator error, in our opinion. That’s why we place it at #3. In a variation the the Fatal Blow, a sharp blow to the top of the head renders the rabbit unconscious. One can then immediately broomstick the rabbit, killing it. Hold the rabbit by the hind feet, head down. He'll not be too sure about this unusual position, but he'll settle down. Smaller fryer rabbits can be gripped at the loin. His back, which is straight up and down, will form a V with the ears, which will be alertly forward. You want a generous V. If you need to, nudge the ears a bit more forward. See picture above left. Strike the rabbit a sharp blow to the point of the V - immediately behind the ears but not on the shoulders. Strike downward. If you're strong, you can deliver the blow karate-style with the edge of your hand. If you're not confident in your strength, you can instead put out the lights with a narrow rod which is about 30 inches long, or so. Our butcher uses a 1/2" conduit pipe (pictured above left). Immediately cut the head off. Cut along the same trajectory as the blow you struck. Your knife will slip easily through the dislocation in the neck. Hang the rabbit by the hind legs, even while in the throes, on heavy hooks, or with slip knots in shoelaces secured by a nail in the side of the butchering space (pictured above right). Allow the rabbit to finish bleeding dry. Killing rabbits, removing heads and hanging them to drain takes only a few moments to a minute or so apiece, no matter the method you choose to use. It is certain that the end of a domestic meat rabbit is nothing like the fate suffered by wild rabbits - running, hiding, dodging, getting caught and then ripped limb from limb while still alive. the ox, the sheep, the goat...."